I’ve been engaged in this ongoing dialogue about support for local contemporary art for quite some time now. Ever since I moved to Sarasota, FL I have experienced a vast amount of creative energy that feels underground, for the most part. Contemporary art collectives and gallery spaces crop up every now and then, which is great because creatives can see Sarasota’s vast potential — the only problem is that they don’t seem to stick for very long. So I wonder; how do we get to a point where new collectives and galleries can become established, and when these new collectives and galleries do become established they, in turn, become a catalyst for new spaces and groups until a domino effect is created? We have a good number of resources, but I think we still need to consider more support from current established institutions, so that artists (young and old) have more of an incentive to stay and help strengthen our art community. For example, when I was recently living in Utah, I loved going to the Utah Museum of Contemporary Art and CUAC because, not only could I view the work of artists living in Los Angeles, Chicago, New York City, Berlin, etc., but I could also view contemporary art that was created by Utah artists! UMOCA even has a “locals only gallery” with a stipend included to help fund each exhibition within that space — AND the work that I saw continually blew my mind because I was viewing powerful, compelling artwork that was created outside of a major art center perspective — it was all new and fresh. I was viewing contemporary art about subjects that were specifically related to the location I was in and that added a whole other dimension to my experience as a viewer. It was also quite clear that these artists were very aware of the contemporary art world, were referencing aspects of it, but not necessarily mimicking it per se — they were adding their own perspective to what I consider an ongoing creative discussion, and it was coming from a Utah perspective. So that makes me think; how amazing would it be to go anywhere in the world and be able to view contemporary art that is representative of that location and its artists’ perspectives, while also being able to view artwork created by emerging and established, national and international, artists in the same space? To me, that would be highly fascinating! Fortunately for Sarasota, I’ve found that Art Center Sarasota is doing just that, and making quite an exciting impression in the process. I recently contacted Art Center Sarasota’s Exhibitions Coordinator, Emma Thurgood, to discuss the Art Center’s 2013-2014 season of exhibitions. KLL: What is, and has been, your vision for Art Center Sarasota since you started your current position? ET: My vision for the Art Center’s Exhibitions Program is to grow it to be a leader in Sarasota’s contemporary arts scene. For me, that means showing a variety of art year round that is visually interesting, thought provoking, and creates a memorable experience that they can’t get anywhere else in the area. I’ve been at the Art Center for a year and a half now, and I feel like we are on a great path with those ideas. For the last few exhibitions, visitors have been telling me, “This is the best show I’ve ever been to in Sarasota.” They said that about “Florida Flavor”, they said that about “African Nouveau” and “Leaf | Textile | Purpose” and I think the trend will continue on through the Incredible Journey Season. KLL: Art Center Sarasota’s 2013-2014 season of exhibitions is titled Incredible Journey; why was that title selected and what should viewers expect to experience during the Incredible Journey season? ET: Last season was called Southern Exposure for a reason: 20 of the 22 exhibitions we produced were exclusively Florida artists. It was a huge success in highlighting the amazing talents of Florida artists. 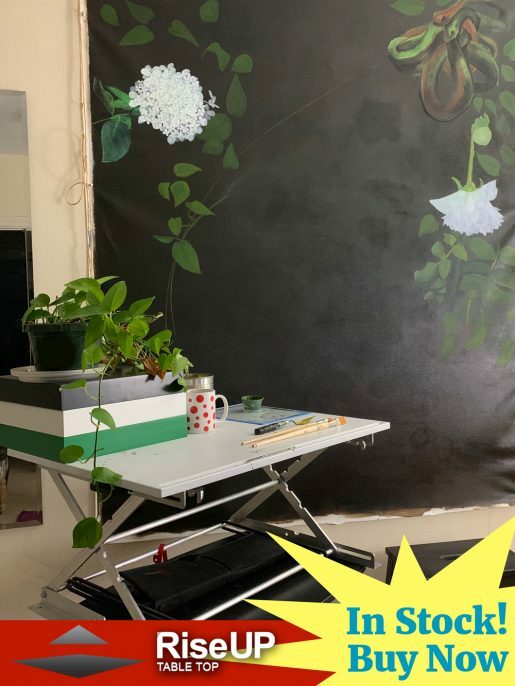 Now, with Incredible Journey, we’re taking viewers on explorations of different art forms and concepts in art, as well as drawing artists from further afield than we normally do. In the past, it was very rare that our curated shows included artists that were outside of the Florida region. This season, we are presenting artists from across America and we have started the eight-year international exhibition program, “Confluence.” This program is an initiative I started where we will be showcasing artists from the countries in which Sarasota has a sister city. This year it’s Israel, 2015 is Russia. I think this season is going to take some viewers’ way outside of their comfort zone. There are a lot of shows on the docket that present works that many people aren’t accustomed to seeing in Sarasota. For me, this is all part of creating a dialogue about what art is and can mean that will break down some barriers that have been put up. KLL: We’ve talked a lot about fostering more support for local artists and creating an incentive for recent graduates to continue to live and work as artists in Sarasota; how is Art Center Sarasota contributing to this goal? ET: Our main contribution towards encouraging students to stay in Sarasota is through Black Box Projects. It is specifically for students and recent graduates to produce an ambitious project. The Art Center provides an exhibition space and time, as well as some financial resources to see the vision of a student come to life. This contributes to their understanding of real world skills because they have to write a professional proposal to be considered and they have to produce the show. Because we schedule so far out in advance, a candidate could be a student when they apply for the Project, but already graduated when the Project finally comes on display in the gallery. Secondly, we have juried shows year round, and students and young artists who have been submitting have been winning awards and selling their work regularly over the past six months. Sarasota in general is a great place for that kind of success, too. In my research of other centers like Art Center Sarasota across the country, very few regions are like ours in that they offer so many exhibition opportunities year round across multiple venues. The rate for being selected to hang in a juried exhibit is very high, as well. In other shows across the country, you are competing with hundreds, sometimes thousands of people and only a small handful will be selected. In the Art Center’s juried shows, we receive around 300 submissions from about 200 artists and hang approximately 140-160 pieces. In the current juried show, “miniatures,” we have 244 pieces on display from a submission pool of 345. Those are some great odds for artists. 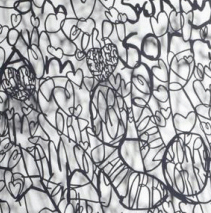 KLL: In your opinion, why should there be support for local contemporary art in Sarasota? ET: A city is only as old as its youngest member. If the art scene continues to alienate the younger artists and audiences as it has in years past, they’ll find somewhere else to go where they feel like they belong. It’s a difficult challenge to deal with, especially as a non-profit, because the young people are not always the financial supporters of an organization. But organizations need to cultivate the next round of supporters because, as with all things, times and people change. Art Center Sarasota does a pretty good job walking this tightrope, I think. I try to make sure that there is something on display for everyone. I have at any given time over 300 artworks on display in the building and they’re all different. No person should be leaving the center saying that there was not a single piece they liked. It’s impossible. KLL: What advice would you give to recent graduates about establishing an art practice/career in Sarasota and/or its neighboring communities? ET: Get involved! It’s hard for students, between classes and jobs, but seriously, there’s still enough down time in their life for them to carve out even twenty minutes a week to go and look at what’s on display in a gallery. The more involved they can become in the arts scene, the better off they’ll be. They’ll have a better idea of who the players are, they’ll be able to meet and speak with many of them at receptions, and it will give them a better idea of how they fit into the art landscape. One of the things I can’t stand is when a young artist comes to me to ask me to put on a show of their work and they have no idea who I am or what I do or even anything about my organization. I teach a professional practices class at the center with Elizabeth Hillmann, our Education Coordinator, and one of the things we talk about is gallery etiquette. I live by a simple rule when it comes to that: date your gallery. Be informed about who they are and what they do before you approach them, be respectful of their time, and if they pick you for representation, treat them with the absolute utmost respect and maintain a good relationship. KLL: What other services does the center provide that the community can get involved with? ET: Art Center Sarasota has a wide variety of events and public programs throughout the year. I have a great lecture season coming up with Kevin Costello and Baila Miller starting on November 21. We also have a killer education program with tons of classes in painting, sculpture, collage, jewelry and other fun stuff. The full listing of classes and workshops can be found at www.artsarasota.org/education. I’m really looking forward to Paper Arts Week November 18 – 22. Then, in March we have tons of programming to accompany our “Confluence: Israel” exhibit and of course, iconcept on March 28, 2014 where art walks the runway! KLL: I am thrilled by the variety of art mediums and artists that are, and will be, exhibiting this season. Can you touch upon the importance of a diverse exhibition space that incorporates the work of local, national, and international artists? ET: The best thing about the space at the Art Center is that we have four different galleries. So I generally show four different shows at any one time. Our largest gallery is always a juried exhibit of predominantly local artists. Some of them come from further afield in Florida, and every now and then we get someone from out of state. The other three galleries are dedicated to curated shows of local artists, community groups and nationally recognized artists. I think some artists would prefer if we only showed local artists all the time, but as a community center, we are not just here for the local artists, we’re here for the viewers too. That’s a difficult balance to manage sometimes. Showing the work of local artists is great, and I do it as often as I can, but showing that work doesn’t mean anything if no one is coming to look at it. What makes a viewer come to look at the local art that we are displaying as opposed to any of the other venues in town doing the same thing? That’s what our curated show of more recognized artists are for- they get the people in the door to come and see something they can’t anywhere else in town. I couldn’t tell you how many times someone has come in to see one of our shows in the front gallery and then bought something from a local artist out of the juried show. It’s also a benefit for the artists showing that they can say they’ve exhibited at a place that has also exhibited such notables as John Chamberlain, Syd Solomon and many others. It offers up some shared prestige. KLL: Can you tell us a little bit about CUBEMUSIC, Sun Boxes, and Pulp Culture? ET: CUBEMUSIC and Sun Boxes, from Craig Colorusso, are the big blockbusters for the opening of our season. I feel like they really kick off the journey. Sound art is so underrepresented in Sarasota. The only other exhibit I’m aware of is the one at the Ringling in late 2011. But, for that you had to pay to go see it or wait for free Monday, and generally the people that need free Monday have to work on Mondays. What’s a viewer to do? Art Center Sarasota is always free and open to the public during our business hours, Mon-Sat 10a-4p. CUBEMUSIC will be transforming the space of Gallery 1 for the next eight weeks. Its cast light and shadows coupled with the soothing deep resonance of sound creates a truly altering experience of the space. For viewers who still aren’t able to come and see the art, the art is coming to you! We are so excited to take Craig’s other installation Sun Boxes on the road around Sarasota. We’re stopping at parks and beaches to bring sound art to the masses. Whereas CUBEMUSIC is somewhat dark and ominous in its sound, Sun Boxes is positively ethereal. You can’t help but feel happy when you see them and hear them. 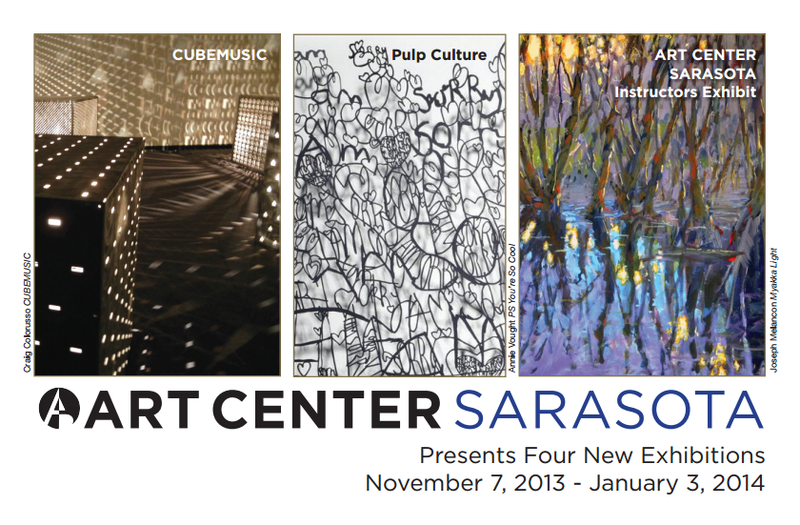 The full schedule of the Sun Boxes tour for November and January can be found at www.artsarasota.org/sunboxes. Pulp Culture is another show opening November 7 that I curated. I wanted to do a fun show about paper because I have such a love for it. I daresay it’s a dangerous addiction. I tried to not be too serious about it and just show fun creative art that would make people smile while educating them about the way that paper can be used for art other than drawing or painting. So far it seems I’ve accomplished my goal because of the feedback I’ve already gotten while I was installing the show.